The tour starts with lunch in Arusha town at 1230hrs. 1400hrs, drive to Karatu for dinner and overnight under the tent. Today you will collect picnic lunches and drive to Ngorongoro crater, proceed descending 2000 feet (over 600 meters) to the floor of the crater for a half day crater tour. Explore the forest areas that are inhabited by monkeys and elephants, the lake area, where you may see the flamingos and the open savannah where the lions hunt for food. Dinner and overnight under the tent in Karatu.The Ngorongoro Conservation Area: A UNESCO protected World Heritage Site and an International Biosphere Reserve, the Ngorongoro Conservation Area covering an area of 8292 sq km consists of the Ngorongoro Crater itself, Empakai Crater, Oldupai Gorge, and Ndutu including the short grass plains of the south eastern Serengeti ecosystem. The crater floor is home to thousands of plain animals, including the rare black rhino, zebra, wildebeest, gazelles, hippos, eland, elephants, and a large predator population of lions, hyena, and jackal. After breakfast at the camp, you will drive to Lake Manyara with picnic lunches. Enjoy a game drive in Lake Manyara National Park whose inhabitants include hippos, monkeys, tree climbing lions, flamingos and other varieties of birdlife. Dinner and overnight at a campsite in Mto wa Mbu.Lake Manyara National Park: Lake Manyara is a scenic gem, with a setting extolled by Ernest Hemingway as “the loveliest I had seen in Africa”.The Park is home to a myriad of bird life and the famous tree-climbing lions. The soda lake occupies 77% of the National Park total area of 330 sqm. Common animals include baboons, giraffe, impala, wildebeest, buffalo, zebra, elephant, hippos, with over 400 species of birds including water birds and the colourful migratory flamingoes. Tanzania invokes thoughts of endless rolling plains, open savannah grasslands teaming with wildlife and the highest mountain in Africa. The landscape is stunning and its beauty unmatched; Mt. 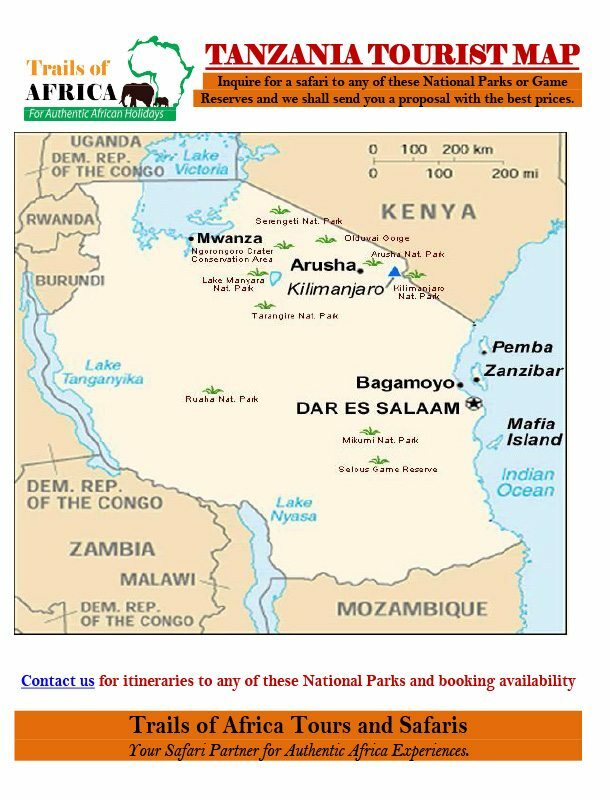 Kilimanjaro – Africa’s highest mountain, Lake Tanganyika – Africa’s deepest lake, Lake Victoria – the world’s second largest lake and the source of the Nile, the Great Wildebeest Migration Herds, the Ngorongoro Crater, Birds of Lake Manyara, etc.